Starlite's trailers are designed to be the longest lasting trailer on the market. We have been building these types of trailer since 1978. That means that with every Starlite Flatdeck Trailer you get over 30 years' experience built into each one. Starlite Trailers can provide you a Flatdeck Trailer for every job or hobby you have. 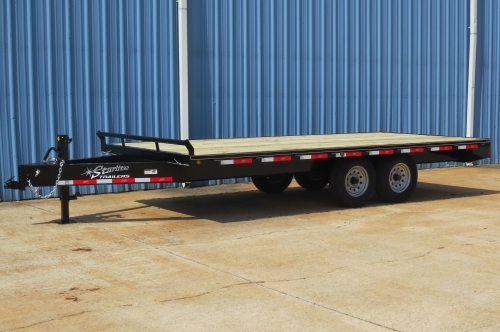 Our Flatdeck Trailers are 102" wide and up to 40' long with appropriate options. Our standard models come with a 5' Dovetail and 3 Fold-Over Ramps. All models have a 5" Channel Iron outer frame with stake pockets and rub-rail. All Flatdeck Trailers come standard as Gooseneck with a 25,000lb 2-5/16" Round Adjustable Coupler and a Toolbox built right into the Gooseneck. We use 3" Channel Iron cross members set at 16" centers on all of our Flatdeck Trailers. However, our Flatdeck Trailers are divided into two major categories. The first is our Tandem Axle Flatdeck Trailer, and the second is our Tandem Dual Flatdeck Trailer. Each of these have a Low-Profile and Normal Profile variation. With our Tandem Axle Flatdeck Trailers there is our Normal Profile and our Low-Profile version. The Normal Profile comes standard with a Torque Tube for stability. Our Low-Profile Tandem Axle Trailer is 4 1/2" lower in deck height and has no Torque Tube due to the cross members passing through the frame for stability. Our Tandem Axle Flatdeck Trailer has a G.V.W.R. of 14,000lbs due to having two 7,000lbs axles, each equipped with electric brakes. The frame and gooseneck are both made from 12" x 14lb Steel I-Beam. With our Tandem Dual Flatdeck Trailers the standard version is our Low-Profile version, but we still offer the Normal Profile version as well. As with the Tandem Axle Flatdeck Trailer the Low-Profile version of our Tandem Dual Flatdeck Trailer is 4 1/2" lower in deck height. All of the Tandem Dual Flatdeck Trailers come standard with a Torque Tube for extra strength and stability. Our Tandem Dual Flatdeck boasts a G.V.W.R. of 22,500lbs due to having two 10,000lb axles, each equipped with electric brakes. The frame and gooseneck are both made from 12"x 19lb Steel I-Beam. When a reliable Flatdeck Trailer is what your livelihood depends on, Starlite Trailers is who you can trust for exceptional quality and strength that is meant to last. Whether you're a Contractor, Farmer, Landscaping Service, or just enjoy Power Toys you can find a Starlite Flatdeck Trailer to meet your professional, personal, or entertainment needs. Starlite's knowledgeable staff and representatives are here to help you will all aspects of your trailer needs. Whether it's helping you find a Flatdeck Trailer for your need, or helping you resolve a trailer problem, our team is ready to provide service from all aspects. You might also be interested in one of our Car Haulers, Auto Haulers or Equipment Haulers. Manufacturers of Equipment, Car and Auto Haulers and Tulsa Trailers. Starlite is located in Claremore, Oklahoma and services our local area such as Tulsa OK, Broken Arrow OK, Owasso OK, Sand Springs OK, Oklahoma City OK, Moore OK, Norman OK & Edmond OK as well as the entire USA!